Dr Massimo A. Hilliard received his PhD in Biological Chemistry and Molecular Biology in 2001 from the University of Naples, Italy. 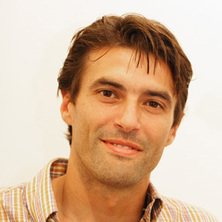 His experimental work, performed at the Institute of Genetics and Biophysics of the CNR (Italian National Council of Research), was aimed at understanding the neuronal and genetic basis of aversive taste behavior (bitter taste) in C. elegans. During his first postdoc at the University of California, San Diego, using the Ca2+ indicator Cameleon he published the first direct visualisation of chemosensory activity in C. elegans neurons. In his second postdoctoral work at the University of California, San Francisco and at The Rockefeller University, he switched from neuronal function to neuronal development, focusing in particular on how neurons establish and orient their polarity with respect to extracellular cues. From September 2007, he is at the Queensland Brain Institute where he established an independent laboratory. We use C. elegans as a genetic model system to study neuronal development. There are currently three lines of research in the lab, and PhD projects and/or postdoctoral positions are available in each topic. 1. Axonal degeneration How neurons can maintain their axonal structure and function over time is not well understood. Axonal degeneration is a critical and common feature of many peripheral neuropathies, neurodegenerative diseases and nerve injuries. The genetic factors and the cellular mechanisms that prevent axonal degeneration under normal conditions and that trigger it under pathological ones are still largely unknown. We aim to use C. elegans genetics to identify the molecules and the mechanisms that control these processes. 2. Axonal regeneration How some axons can regenerate after nerve damage while others cannot is a crucial question in neurobiology, and the answers will be of great value for the medical handling of neurodegenerative diseases and of traumatic nerve injuries. Largely unknown are the molecules and the mechanisms underlying this important biological process. In C. elegans, a new laser-based technology allows single neuron axotomy in living animals, and axonal regeneration can now be visualised in real-time and tackled with a genetic approach. Our goal is to identify the genes and conditions that control this fascinating process. 3. Neuronal polarity and axonal guidance Neurons are highly polarized cells with distinct domains such as axons and dendrites. The polarity of a developing neuron determines the precise exit point of its axon as well as the initial trajectory of axon outgrowth. Understanding how neurons establish and orient polarity with respect to extracellular cues is an important and challenging problem in neurobiology. We wish to understand how different secreted cues regulate the orientation of neuronal polarity and axonal guidance in vivo. Understanding the role of UNC-71 in axonal regeneration. Kim, Shin Ae, Lee, Hyewon, Hilliard, Massimo and Lu, Hang (2014). High-throughput multichannel array device for selective stimulation and long-term in vivo imaging in C. elegans. In: Food, Pharmaceutical and Bioengineering Division 2014. Food, Pharmaceutical and Bioengineering Division 2014 - Core Programming Area at the 2014 AIChE Annual Meeting, Atlanta GA, United States, (1190-1191). 16-21 November 2014. Lee, Hyewon, Kim, Shin Ae, Aubry, Guillaume, Mugno, Paula, Hilliard, Massimo and Lu, Hang (2012). Fast target-selective chemical & optical stimulation based on high-throughput multi-channel imaging device. In: Teruo Fujii, Akihide Hibara, Shoji Takeuchi and Tatsuhiro Fukuba, Proceedings of the 16th International Conference on Miniaturized Systems for Chemistry and Life Sciences, MicroTAS 2012. 16th International Conference on Miniaturized Systems for Chemistry and Life Sciences, MicroTAS 2012, Okinawa, Japan, (434-436). 28 October - 1 November 2012. Understanding axonal fusion: an alternative mechanism to repair injured axons. Understanding the molecular mechanisms regulating neuronal fusion. Axonal fusion to promote nerve repair: molecules and mechanisms. Understanding the role of TDP-43 in motor neuron disease. Femtosecond laser axotomy for in vivo nerve regeneration studies in C. elegans. Protecting neurons and muscle from mitochondrial DNA damage.